← Who Is Aaron Vance? There’s Nothing Like A Good Bath! Have you ever been so dirty that you felt like you’d do just about anything for a good bath? 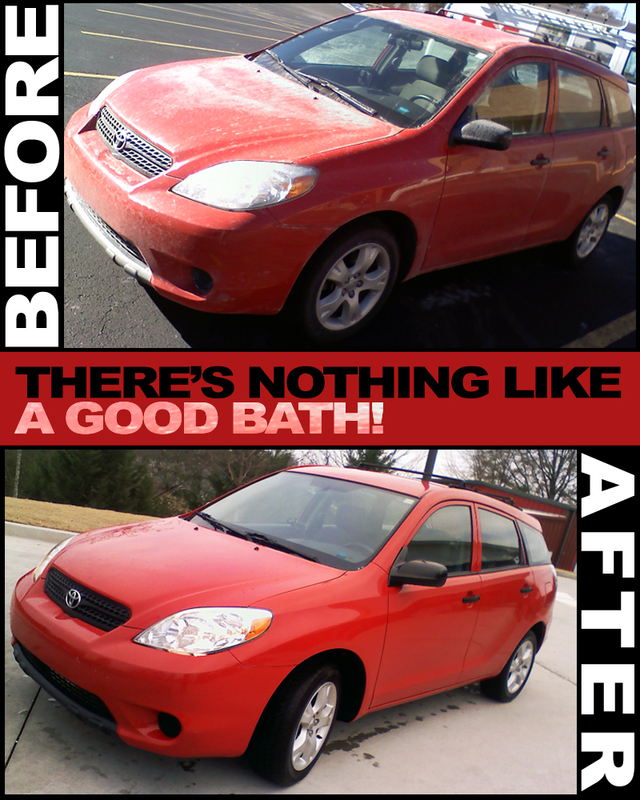 That was the case of our Toyota Matrix after a wonderful trip to Ohio and back over Christmas. The top picture really doesn’t do justice to the amount of cake-frosting-like-salt that was pasted all over our poor car. It got so bad that we’d have to stop every 100 miles to clean the windshield and windows just to see. And since it was below freezing when we returned to Georgia, it was several days before I could find an open car wash to clean off all the grime and junk that had built up. But when bath time came, I think I almost heard my car breathe a sigh of deep relief and joy. Really. OK, maybe not the car. It was probably me. Anyways, it got me to thinking. You know, we need baths too. Life is dirty. We live in a dirty world. We’re heading to Heaven but the road there is covered in things that hinder our view, drag us down and make us feel filthy. Here are a few thoughts about this. Just as I couldn’t wait to get my car cleaned off of the build-up of junk on the outside, Christ gave himself to clean us by the washing of water by the word. This is an interesting concept. Cleansed by his word? Well just think… His word was powerful enough to create the universe… don’t you think it would be sufficient to wash me and you of every spot, wrinkle and blemish? And he wants to clean us just to be able to present us back to himself as holy and without blemish! If my car would have cleaned itself, it sure would have saved me a lot of trouble. I had to find a car wash, fork out money to pay for it, and invest time that could be spent somewhere else… But I wanted a clean car. It was worth it. That’s why Christ gave himself for us. He laid down his own life on the cross to pay for our dirty sin. He died to rescue us from a life of filth! Now, it is with the washing of the water (the Holy Spirit) by the Word (Jesus Christ) that we’re made spotless. In the car wash there were 7 or 8 stages. (I opted for the “Ultimate Wash.” 😉 ) Each stage peeled back another layer of dirt. Each stage was important in itself but near worthless if done alone. I think we have the wrong idea about Spiritual Cleanliness. The Christian might study the Word of God once after messing up thinking, “Good, now I’m clean!” but it’s a process! You have to dwell in his word. The reason sin builds up in our life is because we don’t dwell in his word. We don’t spend enough time with him for him to be able to do his work of cleansing. I could have quickly sped through the car wash but it wouldn’t have effectively cleaned my car. It’s a process. I washed my car less than 24 hours ago. It’s already dirty again. It needs to be constantly washed. The same with us, we must constantly return to the Water by the Word for a fresh cleaning. One time won’t do it. That’s why I take a shower every day. If not, my wife and I might be having some problems. How often do you submit yourself for a spiritual bath by the Lord and his Word? Posted on December 30, 2010, in Personal Study, Random Thoughts and tagged Random Thoughts, Religion and Spirituality, Revival. Bookmark the permalink. Leave a comment.